Trees are exceedingly useful. They clean our air, cool our communities, and make the landscape beautiful. We use them for food, shade, building material, fuel, erosion control, barriers, and many other things. Some look at trees and see an art medium, a canvas to express something we wouldn't otherwise see. And there are quite a few different ways of using trees as art. Despite the title, these artists don't sit in trees and paint; they make art out of trees. British chainsaw sculptor Tommy Craggs recycles fallen trees or trees culled for woodland management. Some can be purchased; others are permanent installations carved from stumps. 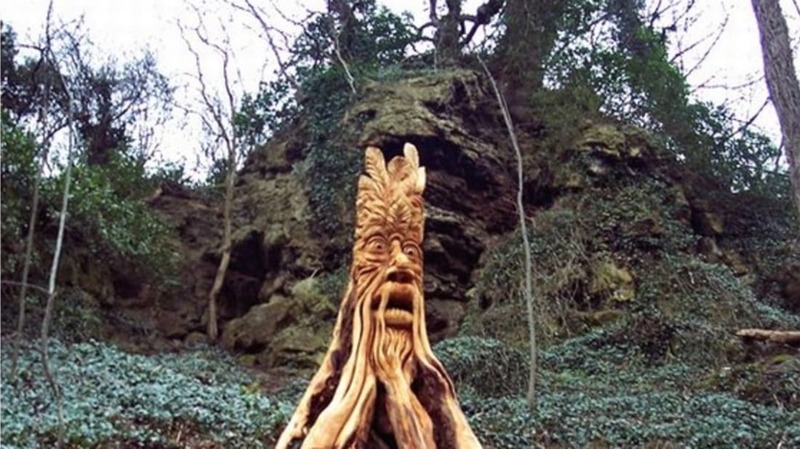 Craggs' work made the news in 2012 when people reported a "guerrilla sculptor" had carved three stumps in a forest in North Yorkshire. They were actually commissioned sculptures by Craggs. The stump pictured above is called King Hollow of The Abbey Road. West Cornwall artist David Kemp is inspired by landscapes, whether natural or man-made. He recycles materials into new artworks. 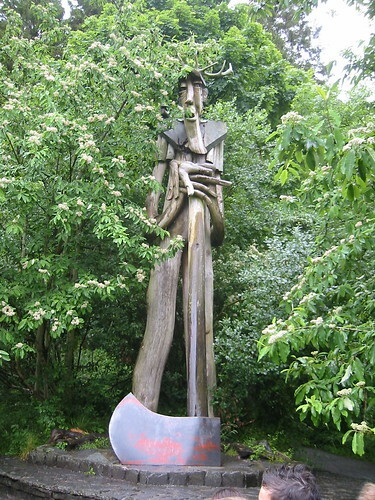 His tree sculpture called The Ancient Forester was commissioned by Grizedale Forest in North West England for their outdoor sculpture collection. Photograph by Flickr user Linda Hartley. Sculptor Joseph Wheelwright works in trees, stone, bones, and other natural materials. 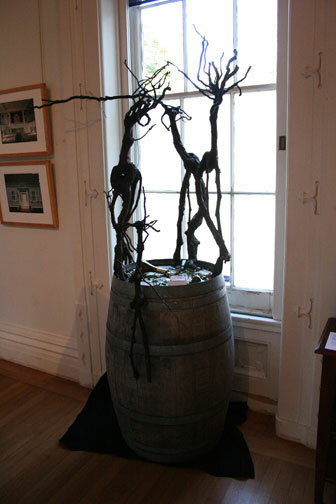 He casts some of his tree sculptures in bronze as well. See how he takes an entire tree and uses its natural shape to bring out a form. The sculpture shown here is called Pine Tree Figure. Walter Channing began his art career when he rescued wood from building demolitions because he hated to see good wood go to waste. From these materials, he made furniture and artworks. This later led to using discarded tree trunks as an art medium. Oh, and he's also the founder of Channing Daughters Winery, which uses one of Channing's upside-down tree sculptures on their wine labels. Axel Erlandson was a pioneer in tree shaping, or taking living trees and making them grow into artworks. He was a farmer in California and began this hobby in 1925. 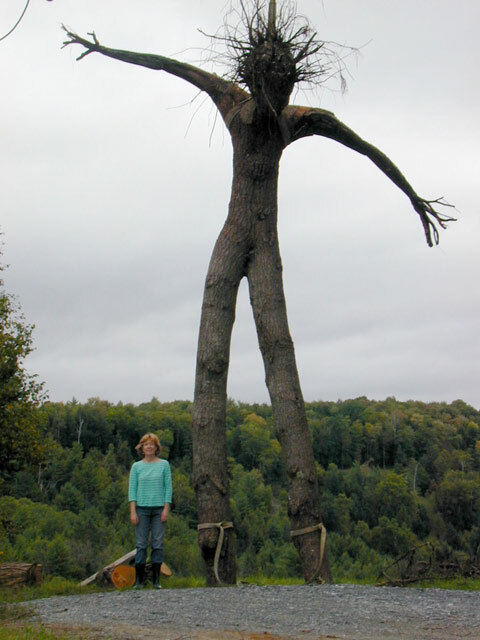 He opened a tourist attraction in 1947 called The Tree Circus, where he transplanted his tree sculptures. Many of his trees still exist, although Erlandson died in 1964. You can see them at what is now Gilroy Gardens theme park in California, or see more pictures here. Photograph by Flickr user Jay Peeples. John Krubsack made furniture from wood, but in 1907, he started an experiment to see if he could grow a chair instead of putting one together. He planted 32 box elders from seed and grafted the trunks together as they grew. Krubsack shaped the trees for seven years until a chair shape emerged, and only four sets of tree roots remained as the legs of the chair. He "harvested" the completed chair after eleven years. 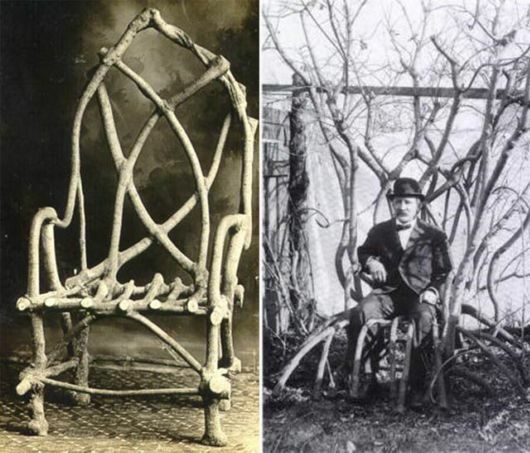 "The Chair That Grew" was exhibited at the 1915 World's Fair and was featured in Ripley's Believe It or Not, and is now displayed at Noritage Furniture in Embarrass, Wisconsin. Pooktre Tree Shapers is the collaborative tree art of Peter Cook and Becky Northey. They grow plum trees that are shaped into functional furniture, such as tables and chairs, and artworks that are shaped like people or abstract designs. Some are specifically grown to be harvested and sold; others are permanent living sculptures. 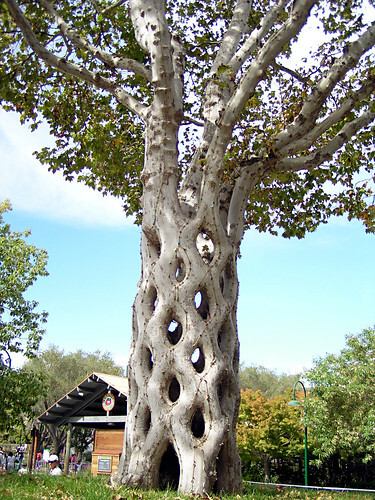 Richard Reames is a arborsculptor who shapes trees, promotes the art of tree shaping, and teaches tree shaping. Reames' website includes some how-to pages, such as how to grow your own chair. In the pictures above, he built a "branch office" by adding a platform to living trees and shaped the growing branches into walls around the floor. Tim Knowles is a multimedia artist. 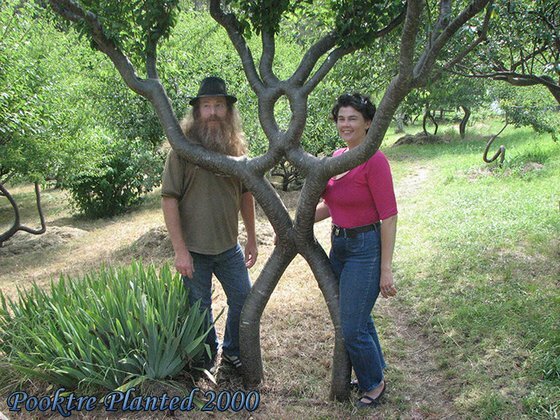 In 2005-2006, he designed a project called Tree Drawings, in which trees themselves created art! Knowles attached drawing implements to the branches of various types of trees and set an easel nearby. The action of the wind and weather aided the trees in their drawing. 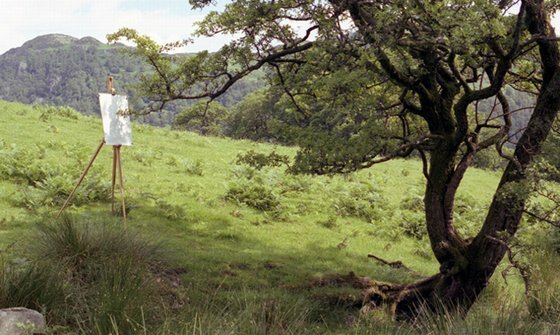 Then each finished work was exhibited next to a photograph of the tree in the process of drawing.